Copa Airlines Announced New Direct Flights between Suriname and Panama from July 6! Copa Airlines is starting new non-stop service between Johan Adolf Pengel International Airport (Paramaribo, the capital of Suriname) and Tocumen International Airport (Panama City) from July 6, 2019. Once this service begins, Suriname will be quickly and efficiently connected to 32 countries in North, Central, South America, and the Caribbean through the Hub of the Americas. The airline will operate flights twice a week on Wednesdays and Saturdays using Boeing 737-700 aircraft. The aircraft features 12 seats in Business Class and 112 seats in the Main Cabin. 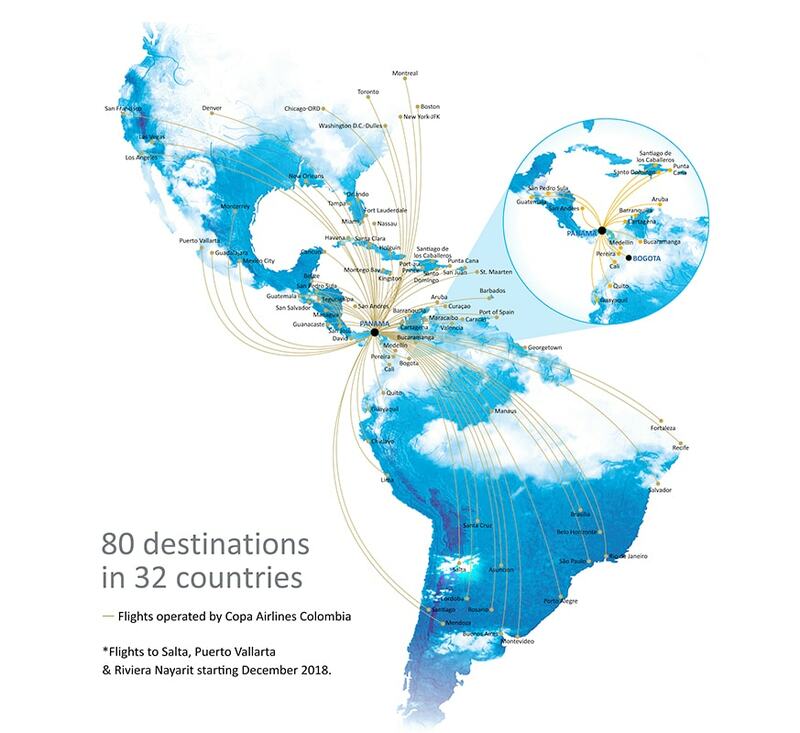 Presently, Copa Airlines operate an average of 350 daily flights through the Hub of the Americas located at the Tocumen International Airport (Panama City). Is the best hub to connect in Latin America. Fast gate-to-gate seamless connections without having to go through immigrations and customs in Panama. Offers access to more non-stop international destinations than any other hub in the region. Has the largest Duty Free in the region. Business Class passengers, ConnectMiles PreferMembers Gold, Platinum, Presidential, and Star Alliance Gold status members can enjoy special privileges when flying on Copa without leaving the ground. The Copa Club is located at Panama Tocumen Airport, the Hub of the Americas. Additional benefits at the lounge include free Wi-Fi, work stations, telephones, bar area, showers, and play room for children. Includes complimentary hot meals and drinks (wines and spirits), in-flight entertainment with the latest movies, TV shows. and more. And complimentary checked luggage to final destination. Copa Airlines offers web check-in facility to its passengers. Travelers can check-in on Copa.com or download the mobile app to do web check-in directly on the phone. Boarding passes are available between 36 hours and 1 hour before flight’s scheduled departure time. For flights to/from USA, boarding passes are available between 24 hours and 1 hour prior to departure. Copa Airlines Hub - Airports used as transfer points to get passengers to their intended destination.